Sheffield Wednesday boss Stuart Gray believes Wolves will be on a mission when they visit Hillsborough this weekend. Following a positive start to the season, Wolves have fallen into the bottom half of the Championship after a six-match winless run. But despite Wolves’ poor sequence of results, Owls head coach Gray does not necessarily think it is a good time to play Kenny Jackett’s side. He told The Star: “Wolves will be like a wounded animal. Kenny [Jackett] is a very experienced manager and I’m sure he will be trying to fire his players up. “They are in a bit of a rut but will be thinking things can quickly turn as Nottingham Forest and Norwich have shown. 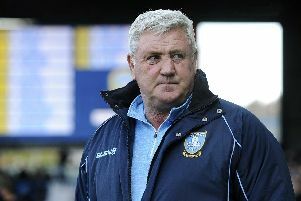 “Kenny will probably be telling his players that Sheffield Wednesday haven’t got too many results at home so they might look at the game as a release for them go away from Molineux to try and get that win on the board. Although Wednesday have lost just one of their last eight matches, Gray is calling on his side to maintain their impressive form. He said: “We always had that self belief that things would turn and I knew our fortunes would change.